Ben Martínez’s trumpet career started in his eighth grade year of middle school. 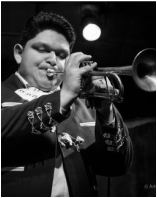 Soon, he was studying Mariachi trumpet and was in pursuit of his dream to become a performing Mariachi. After years of playing with his high school, he decided to take the next step and join the Santa Fe Youth Symphony Association’s Mariachi Estrella. As a student of Jose Santiago, Ben’s playing grew to new heights. Currently, he is a student at the University of New Mexico, working to reach the next level. At UNM, Ben has been playing with the University’s Mariachi ensemble, Mariachi Lobo de La Universidad de Nuevo Mexico, as well as the University’s Spirit Marching Band. Ben is excited to get started in his position with the SFYSA and hopes to help his students in the way that his teachers have helped him. Ben has studied under Gerard Flores, Jose Santiago, and Jeffrey Piper.